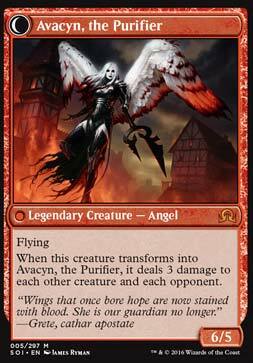 Both halves of Avacyn are brutal. Her first side is a 4/4 that flashes in to thwart most potential attempts to clear the board; even if she never flips, she's still a 4/4 with vigilance and flying that can put a close game in the bag or turn an unfortunate turn of events in your favor. If she does flip, she becomes a 6/5 that wipes the board of all the small creatures, and she can close games out even faster. And her flip trigger isn't too hard, requiring something to die. With a lot of sacrifice outlets, it's possible to flip Avacyn the turn after she resolves, and you can clear things out effectively. The value of Avacyn is that she can fit into almost any deck. Control likes her, aggro also likes her, and she pulls her weight in almost every game she gets into. She's one of the better creatures we've seen in a while. 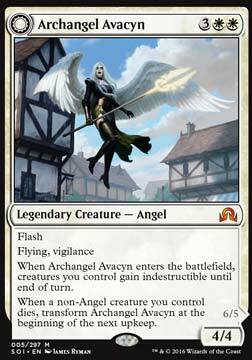 Avacyn does so many things, almost as many as the couple of four-loyalty-ability planeswalkers, almost enough to make you look askance at every double-faced card that does fewer things. Her day side, a creature with Serra Angel's stats plus an ability that lets you overextend as much as you want, would probably be enough to get her considered for tournaments, but when you combine it with a more or less one-sided Anger of the Gods effect as a transformation ability, her value goes through the roof. The fact that it triggers when another of your creatures dies means that she also goes in decks that care about creatures dying for some kind of effect, or at its simplest adds to the element of punishing opponents for trying to get rid of your things.